I have lost count of how many times I’ve heard people say they can’t eat healthily because they can’t afford it. Yes…fresh fruit and vegetables can be expensive, especially if you’re worried that half of it will go to waste. BUT there’s so many ways you can use up fruit and vegetables, team that with a few tricks when shopping and I promise you, you can serve up a lovely nutritious meal for less than the cost of a pizza! It takes a little bit of thought and planning so I’ve put together my top 12 tips to help you save money. 1. Use frozen or tinned fruit and vegetables. Both tend to be cheaper than buying fresh, and they keep much longer. They’re still just as good for you nutritionally, just opt for fruit in natural juice as opposed to syrup and select tinned vegetables in water without too much added salt. Dried goods like pasta, rice and noodles keep for ages and the large packs are often significantly cheaper than the smaller ones. For example, I did a quick price comparison…for a 500g bag of pasta you pay £1.90 (2.40€) per kilo, for a 3kg bag it works out at £1 (1.26€) per kilo. That’s almost half price! 3. Check the price per kilo. Most shop item labels now will state the price per kilo in addition to the item price. This is a handy, easy way to check if you’re getting best value for money. Once you become used to checking this, it becomes second nature and addictive. You’ll be in store for some surprises! 4. Go for store brands. When you buy branded goods, you’re paying a premium for the brand and fancy packaging. There are lots of foods that taste very similar whether it’s branded or stores own. Having said that, there are a couple of foods where I’ll always buy the branded version as the store versions just aren’t as good. However, it’s something you can trial with your everyday items and you could end up saving yourself a small fortune! 5. Make use of offers. Whether it’s buy one get one free, 20% extra free, or reduced because it’s going out of date, take advantage! Most stores will reduce items in the evenings, so time it well to get the best deals. Things like fish, meat and even fruits and veggies freeze well, split them into portions though, otherwise they may be stuck in a clump when you come to use them. Chopping up the vegetables will also save you time later on, plus frozen fruit tastes great in smoothies. Just make sure you have plenty of room in the freezer! 6. Bulk out with pulses. If you don’t often cook with lentils and other pulses, I strongly recommend that you try them. The term ‘pulse’, used interchangeably with ‘legume’, encompasses all types of beans, peas and lentils. They’re a great source of protein, fibre, iron and other vitamins and minerals. You can buy them canned or dried and they make a great addition to soups, curries or casseroles. Just ensure you cook them as per the instructions. 7. Use up fruit and veg that’s passed its best. 8. Get a loyalty card. Yes, I know this sounds obvious and one would think that most people do this now, but it’s so simple yet easily forgotten. Most stores offer vouchers linked with the amount you spend and send a monthly magazine containing details of offers. It’s cheaper to buy fruit and veg that is in season so store promotions will often reflect this. You’ll also notice that if Spain has a great summer for tomato production, the price of tomatoes comes down. It’s just something to watch out for. 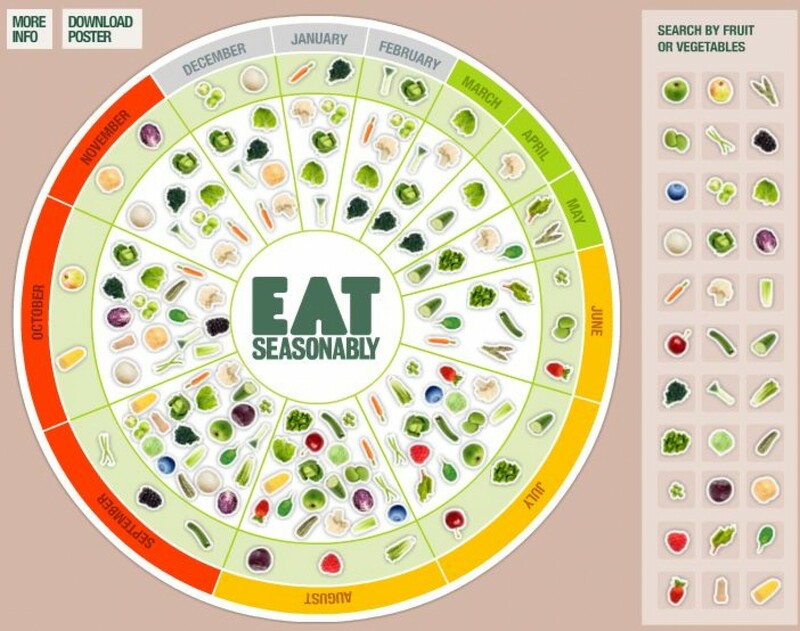 If you’re not sure what’s in season when, check out this great chart by eatseasonably. I’m spoiled for choice here in Brussels with food markets on pretty much every corner. I don’t just love them because of the bargains though, it’s the whole atmosphere. Prices are often set per kg and generally are cheaper than supermarkets, plus, if you’re buying lots and visit them regularly, they’ll often throw in a free broccoli or squash – you’d never get that in a supermarket! If you have a garden and the space, one step up from going to the markets would be to invest in your own little veg patch. Not only can it save you money but it’s also a lovely way to spend time with your children and reap the rewards of your hard work. I said at the start of this list that it can take a little bit of planning, so if you really want to make every penny (or cent) go as far as it can, then you’re going to need to have a meal plan. It’s a good idea to think about recipes that use similar ingredients or how leftovers from one meal can be used in the next. For example, the fresh ingredients for a spaghetti bolognaise aren’t all that different from a chilli, and that left over curry would taste great on a jacket potato. So there’s my top tips, let me know if you put them into action next time you’re shopping! Are there any more you use? Great tips! I totally agree that planning is a HUGE help for saving money, not wasting food, and still being able to eat healthy!